The USC Dornsife College of Letters, Arts and Sciences enriches the undergraduate experience with discovery-based learning opportunities, such as research partnerships with faculty members across the natural sciences, social sciences and humanities. 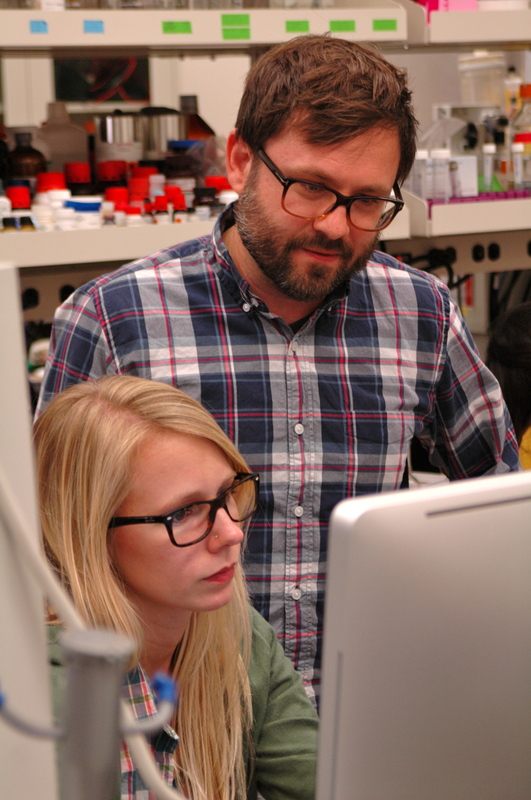 Assistant Professor of Chemistry Matt Pratt and a student analyze protein expression data in his laboratory. The USC Dornsife College of Letters, Arts and Sciences is the academic heart of the University of Southern California. The oldest, largest and most diverse of USC's academic divisions, USC Dornsife is composed of approximately 10,000 undergraduate and graduate students and nearly 800 faculty. The breadth and depth of USC Dornsife is vast with more than 30 academic departments and programs across the humanities, social sciences and natural sciences, and dozens of research centers and institutes. USC Dornsife fosters the liberal arts ethos of small classes and close working relationships between students and faculty within the context of a great research university, where internationally recognized scholars are constantly pursuing new ventures. Undergraduates select from more than 150 courses of study as well as explore opportunities such as overseas studies, service-learning and internships. With more than 75 doctoral degree and master's programs administered through the USC Graduate School, USC Dornsife not only trains the next generation of scholars, but also ensures that America's research enterprise remains competitive. The departments of chemistry, earth sciences, and physics and astronomy, cooperating with one another, offer a physical sciences major in the natural sciences and mathematics. The major requires specific lower-division courses in chemistry, earth sciences, mathematics, physics and 28 upper-division units of major courses in the four departments. Of the 28 required upper-division units, at least four units must be taken in each of the four cooperating departments. A program major consists of designated courses and not less than 24 upper-division units chosen from the list of courses which make up the program. The college has a number of special programs, many of which offer majors. A progressive degree program enables a USC Dornsife College of Letters, Arts and Sciences undergraduate to begin work on a master's degree while completing requirements for the bachelor's degree. The progressive degree may be in the same or different departments, but should be in a closely-related field of study. Students in a progressive degree program must fulfill all requirements for both the bachelor's degree and the master's degree except for the combined number of units for the two separate degrees. The master's degree may be awarded at the same time as, but not prior to, the bachelor's degree. The student receives two diplomas. Further details about progressive degrees can be found on here. The first and second bachelor's degrees may be completed at the same time but there is no requirement that they be. If a student wishes an adjustment to the major requirements in his or her department or program, the department adviser may, with the support of the department, substitute a comparable upper-division course for a required one. Substitutions and waivers of USC or transfer courses for upper-division requirements for programs are to be limited to a combination of 25 percent. Lower-division courses cannot be substituted for upper- division requirements. No more than 40 upper-division units in the major may be applied to any degree under the jurisdiction of the USC Dornsife College of Letters, Arts and Sciences. A student wishing to exceed this limit must obtain the - approval of the major department and the dean of undergraduate programs. The USC Dornsife College of Letters, Arts and Sciences offers a wide array of minors that can provide unique breadth and complement or enhance the major field of study. Many of the college minors themselves are interdisciplinary and combine classes in two or more college departments or work in college departments with classes or internships in one of USC's professional schools. For those undergraduate students earning a degree in the USC Dornsife College of Letters, Arts and Sciences, a minimum of 104 units applicable to the degree must be earned in college academic departments. For students graduating with a minor or a second bachelor's degree, this minimum is reduced to 96 units. Other exceptions will be considered by the dean of undergraduate programs in Dornsife College. Academic advising is mandatory for all students entering the USC Dornsife College of Letters, Arts and Sciences until they have completed 32 units at USC. Students without declared majors are required to receive academic advising every semester. All students in the USC Dornsife College of Letters, Arts and Sciences are strongly encouraged to seek individual academic advisement at least once each semester until graduation. Guidance regarding academic requirements, policies and program planning is available in the Dornsife College Advising Office by appointment or on a walk-in basis. Advising in major course requirements is available within the department of the student's major. The pre-graduate school adviser assists USC undergraduates and alumni interested in applying to all graduate programs other than law and medicine. The adviser helps students determine when and if they should apply to graduate school and guides students in the process of researching and choosing appro priate schools and programs. Students can expect support in such areas as navigating the admissions process, writing statements of purpose, requesting letters of recommendation, exploring test preparation resources, and identifying and pursuing sources of funding. The Office of Overseas Studies provides semester and year-long opportunities for students to study in other countries. Eligible students can choose between 51 academic programs in 29 countries and study for one or two semesters. The Office of Overseas Studies is located in the College House, Room 201. For more information, call (213) 740-3636, email overseas@usc.edu or visit usc.edu/overseas. Dornsife College also offers short-term course work abroad in several different formats. For more information, contact the associate dean at (213) 740-4949 or Overseas Studies at (213) 740-3636. The Office of Pre-Health Advisement serves all current USC students, alumni and post-baccalaureate students who are interested in pursuing a career within the health professions (e.g., medicine, dentistry, pharmacy, etc.). Pre-health advisers are committed to providing an array of student-centered advisement services and support tools tailored to meet the individual needs, interests and goals of pre-health students. The program values a sense of community; meaningful relationships with students, staff and faculty; academic excellence; leadership; wellness; and learning through community service, clinical exposure, laboratory research and campus organizations. Pre-health students are supported in all aspects of the health professional school application process, including how to write an effective personal statement and how to request appropriate letters of recommendation. The Office of Pre-Health Advisement provides a letter of recommendation storage and forwarding service to help streamline the health professional school or graduate school application process. In addition, it offers pre-health curriculum planning; assistance with major and minor selection; workshops and events; and opportunities for clinical, research and volunteer activities. The office encourages involvement in the campus community and pre-health student organizations. The Office of Advanced and Professional Programs administers the USC Dornsife College of Letters, Arts and Sciences multidisciplinary graduate programs not housed in traditional departments or units. A multidisciplinary degree program, the Master of Liberal Studies (MLS) is designed for motivated, college-educated individuals who wish to further their intellectual growth and pursue graduate work part-time in the evenings. See here for course requirements. The program is designed for individuals pursuing writing as a career in fiction, nonfiction, screenwriting, television writing and theatre. See here for course requirements. This program offers qualified undergraduate students an opportunity to approach their discipline(s) of study through the critical application of multimedia expression and scholarship. The student experience will be characterized by smaller classes taught by leading faculty members and enriched by a program of lecture series, visiting scholars, symposia and conferences. For complete program requirements, see the USC School of Cinematic Arts section.